ON THIS DATE (31ST OCTOBER) 45 YEARS AGO : 'UP LIKE A BIRD'! The 'Alouette II' helicopter (pictured) which the IRA used on the 31st October 1973 - 45 years ago on this date - to rescue three Irish republicans from Free State custody. In March 1973, IRA leader Joe Cahill was arrested by the Free State Navy in Waterford, aboard the Claudia, a ship from Libya loaded with five tons of weapons, and was sentenced to three years imprisonment, and another IRA leader, Seamus Twomey, was appointed IRA Chief of Staff. In early October that year, Twomey was caught and arrested by the Free Staters and imprisoned in Mountjoy Jail, which meant that three top IRA operatives (Twomey, J.B. O'Hagan and Kevin Mallon) were now housed in the one location - and the IRA wanted them back! An 'American businessman', a 'Mr. 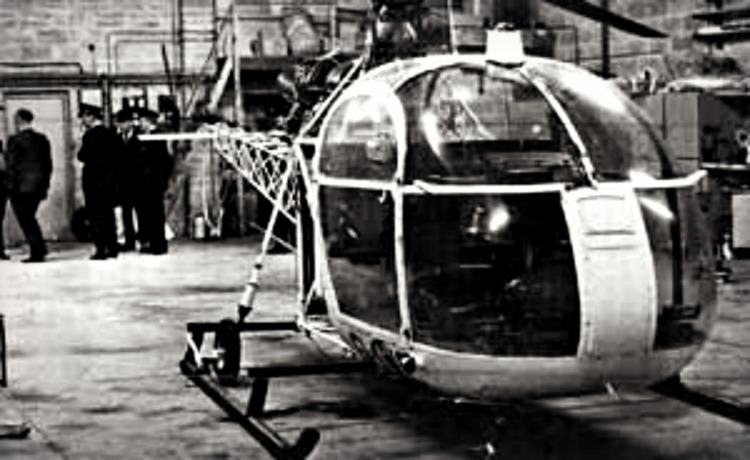 Leonard', approached the manager of the 'Irish Helicopters' company at Dublin Airport and discussed hiring a helicopter for an aerial photographic shoot in County Laois and, after being shown the company's fleet of helicopters, this 'businessman' booked a five-seater Alouette II helicopter for October 31st. 'Mr Leonard' arrived at Irish Helicopters on the day and was introduced to the pilot of the helicopter, a Captain Thompson Boyes, who was instructed to fly to a field in Stradbally, County Laois, to pick up photographic equipment. After landing, the pilot saw two armed and masked men approaching the helicopter from nearby trees and he was held at gunpoint and told he would not be harmed if he followed instructions. 'Mr Leonard' left the area with one gunman, while the other gunman climbed aboard the helicopter armed with a pistol and an Armalite rifle. Captain Boyes was told to fly towards Dublin following the path of railway lines and the Royal Canal, and was ordered not to register his flight path with Air Traffic Control. As the helicopter approached Dublin, Boyes was informed of the escape plan and instructed to land in the exercise yard at Mountjoy Prison. On Wednesday, 31st October 1973 - 45 years ago on this date - at 3.40pm in the afternoon, the Alouette II helicopter landed in the 'D Wing Exercise Yard' of Mountjoy Prison in Dublin, when a football match was taking place between the prisoners, and Twomey, O'Hagan and Mallon jumped aboard, but were quickly spotted (!) by an alert (!) prison screw who used his training and power of intuition to take immediate action - he *called on the screws at the gate to close them over as he feared the helicopter was trying to escape (*according to the RTE 'Scannal - Prison Break' programme!). Another IRA prisoner who was in the yard at the time recalled how an embarrassed screw told him that he had apologised to the prison governor in relation to the incident, saying that he thought the helicopter contained a visiting (Free State) Minister for Defence (and well-known publican) Paddy Donegan : the IRA prisoner replied that, in fact, "..it was our Minister of Defence leaving...!" All three men reported back to the IRA and continued their work for the Movement but, after a few weeks of freedom, Kevin Mallon was recaptured at a GAA Dance in the Montague Hotel in Co. Laois on 10th December 1973, J.B.O'Hagan was recaptured in Dublin in early 1975 and Seamus Twomey managed to remain uncaptured until December 2nd, 1977, after the Special Branch came across him in a 'suspicious car' parked in Sandycove, in Dublin. He had managed to evade the forces of 'law and order', North and South, for fifty months, despite been hunted by the best that Leinster House and Westminster could throw at him! 4 (SO FAR) FOR THE 42ND ON THE 25TH! 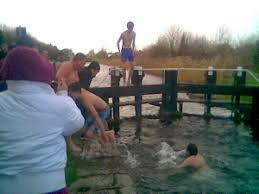 The CABHAIR Swim (pictured) : the 42nd successive Cabhair Swim (1976-2018) will be held, as usual, on Christmas Day next at 12 noon at the 3rd lock of the Grand Canal in Inchicore, Dublin. We weren't going to mention this event until mid-November (...it's only Halloween and we're already talking about Christmas!) but the initiative was taken from us on social media, not least by this eager beaver - that brave man will be one of four confirmed swimmers on the day with, we're told, at least another two swimmers to be confirmed between this and then. The local Cabhair Crew will be doing the annual collection of 'goodies' from the surrounding shops, pubs, clubs etc in the next few weeks and, as usual, the Swim tables will be overflowing (!) with the proceeds, which will be distributed to those present on the day. All funds raised will go here, as always and, again as always, there are no expenses requested or taken in relation to the event. We'll definitely give this another plug before the day, and we'd ask our readers to copy and paste/share this fundraising gig on their own blogs/pages etc and, if you can attend, please do so - it's for a great cause and the craic does be Ninty! Much has been said by the political parties in the Republic (sic) on the imprisonment of Mr. Liam Kelly in Crumlin Jail, Belfast. The sympathy of the Irish people always went to the men in jail, and to Liam Kelly. 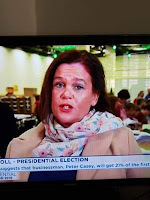 But before our (sic) politicians condemn the imprisonment in the Six Counties, they might pay a visit to the cemeteries and churchyards of the Republic, (sic) and the jails, and they can also see many memorials to Irish nationalists over the past 32 years. If we survey the position we will find that from 1922 to 1932 the Free State government, as it then was*, gave us coercion acts, military courts, internment camps and 77 executions. Many nationalists had to flee the Free State, the chief industries being unemployment and emigration. We will find that from 1932 to 1948, Fianna Fáil (the 'Republican Party') gave us a similar system and between shooting, hanging and deaths in prison became a good second with a total of 33 executions. Trial by jury in these cases was abolished and in many cases inquests prohibited and, together with this, hundreds were imprisoned without trial. It is not my purpose to condone coercion in the Six Counties or the system that exists there, but why should we condemn tyranny in one place and condone it in another place? As I am one of the unfortunates not overburdened with intelligence, I would like to know what difference does it make to a nationalist whether he is jailed or executed by the unionist government of Stormont or the 'republican' government of Dublin? I think it is time we started to put our own house in order. Then, at about 7pm on the evening of Monday, the 5th of December in 1921, Michael Collins and others left a meeting in Downing Street in London to discuss issues among themselves and, having done so, returned to that same venue later that night where, at ten minutes past two on the morning of Tuesday 6th December 1921, Michael Collins and those others accepted 'dominion status' and an Oath which gave "allegiance" to the Irish Free State and "fidelity" to the British Crown - the Treaty was signed and, within six months, a Civil War was raging in Ireland, between the British-supported Free Staters and the Irish republicans who did not accept that 'Treaty'. Confusing, all right! Two Michael Collins' featured above - one in a wrongly-captioned graphic complete with a quote from the other Michael Collins, followed by quotes ** from that same, unpictured, Collins! The best way to differentiate between them is to remember that only one of them went on a successful mission and did not wreck havoc afterwards on those who once stood side-by-side with him. And in relation to the above quotes - from here and here. And please note that we didn't photoshop the above graphic - we found it here ; *...and this definition * might be useful for our overseas readers..! POPPY-NECKED BUT NOTHING TO CROWE ABOUT. - Seán Crowe, from Tallaght, in Dublin, who is (...and has been, for decades) 'on board' with the political direction of PSF in requesting improved 'civil rights' from Westminster for the citizens of the occupied Six Counties rather than demanding a British military and political withdrawal. Seán was recently at a meeting of the 'British-Irish Parliamentary Assembly' grouping (which he co-Chairs) and, in what was described as an "agreed choreography", he declined an invitation to propose a toast to the English 'queen' - then, as arranged, the Free State ambassador to Britain, Adrian O'Neill, stepped-in and proposed the toast and our Seán raised his glass in salute to his majesty, after which he and his British chums laid Poppy wreaths at a war memorial in Westminster Palace, claiming that he done so as he "..didn't want to be putting anybody in an uncomfortable position" by not doing so! And, indeed, no doubt, it would make Seán and his type "uncomfortable" to use such occasions and meetings as an opportunity to highlight the continuing and unwanted British military and political presence in Ireland. Waterford, traditionally a stronghold of reactionary 'loyalty' ("Treason anywhere but in Éire") has in the last few months shown an encouraging rise of interest in the Republican Movement. The Northern raids have brought home to many genuine but misled nationalists the basic fact of British military occupation of part of Ireland and the futility of trying to oust force by appeasement. The result has been a spontaneous influx of recruits for the Army Unit and the establishment of a cumann of the civil organisation, Sinn Féin. The cumann, named in honour of Waterford's pride, Cathal Brugha, has been fortunate in acquiring the clubrooms in Colbeck Street in Waterford which were occupied by Sinn Féin and the Volunteers right through the stormy years 1917 to 1922. 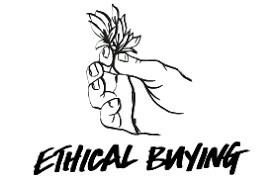 There are dilemmas facing consumers who consider the use of boycotting certain goods - the shifting web of corporate interests and continually evolving ethical considerations means it can be a daunting task for an individual consumer to know how best to use their purchasing power for good. But two points are worth making in response ; boycotts can still play an important role in driving change and there is much more to ethical consumerism than simply the refusal to buy. Boycotts work best when they are part of a wider co-ordinated campaign rather than simply an isolated action - the most famous example is the struggle against apartheid in South Africa. Equally, boycotts are appropriate when called for by the legitimate representatives of the people you are trying to help. On her release from house arrest recently, Aung San Suu Kyi, the elected leader of Burma, reiterated her call for a tourism and investment boycott until the military government negotiates a return to democracy. While individuals always have the right to express their ethical principles by refusing to buy a product which offends them, consumers can often make more of a difference by choosing to buy particular products - this sort of positive purchasing power is often called a 'buycott', not a 'boycott', and 'Fairtrade' products are one example of this : the 'Fairtrade' label is an independent guarantee that the producers in the Third World get a fair price, with a little extra to invest in the community and the environment. In the case of coffee this can be the difference between survival and ruin. The price of coffee on the world market is at its lowest point for 30 years, selling at $50 for a 100lb sack having touched $280 five years ago. The same amount of coffee costs $70 just to produce in Guatemala and will sell through coffee shops here for between $15,000 and $20,000. Faced with this crisis, 'Fairtrade' offers real hope to coffee farmers and their families, offering a minimum price of $126 for 100lb... (MORE LATER).